Miniature of the Peace & Faith Angel. Figure 4"H is holding an ascending dove. Embellished with beads & rhinestones. This angel can be given to someone who has gentle guiding qualities. She represents those who are light hearted yet resilient. 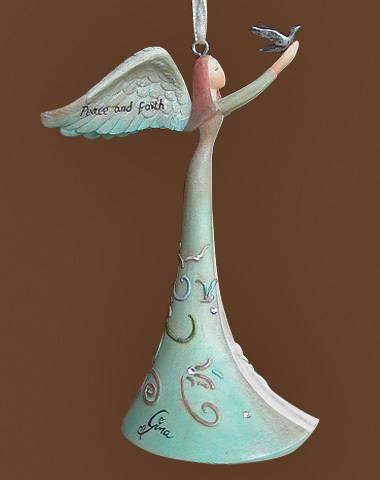 This angel holds an ascending dove symbolic of the message of peace. Her soft cool color palette suggests calmness, serenity and contentment. A lovely piece you can hang year round.